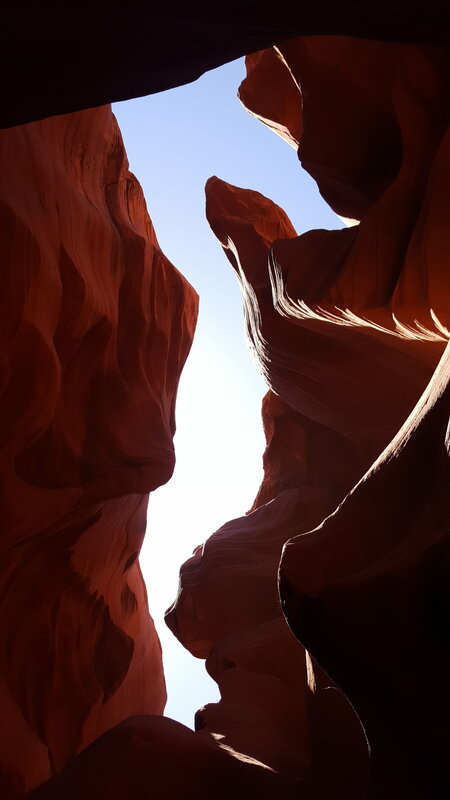 When I look back on our time in Page, Arizona, the deepest corner of my heart aches. It was in this spot that we spent the final leg of our year "hitting pause." Even now, as I write two months later I can't help but feel nostalgic. Feelings, memories, and gratefulness rush back to me like a tidal wave. I miss it. I realize I still really miss it. We have been in our comfortable house with our comfortable furniture, and appliances, and modern conveniences, and jobs for a couple months now. I'll admit it has taken us awhile to fully settle in. We realized quickly that we had changed during our period away, and we were trying to find our footing in a place that was once so familiar to us a year ago but didn't feel so familiar now that we were back. The first few weeks in Durango were the most difficult. A string of bad luck hit us (and perhaps some bad attitudes too). Chip and I felt discouraged and spiritless during this homecoming we always envisioned as happy. For me, I felt we were still within an arms reach of our trip. I didn't want to give up the lifestyle. We had hit a groove I can never begin to explain in person or on paper (er, blog). But each day that passed I felt it slipping further from my grips and when I would allow myself to sit and think deeply about it, I found myself smiling that it happened but saddened that it was over. But I carried on about my business - working, meeting up with friends, grocery shopping, doing the day to day grind that we often get accustomed to. In those moments I would lose track of our trip. Did it actually even happen? Was it all just a dream? Re-reading the blog, listening to the boys' recollections of places and people, and telling our stories reminds me it most certainly was not. Our time in Page was a reminder that living out of a van (& with children) provided yet another rich opportunity to see and do something that has been on our bucket list for a very long time. 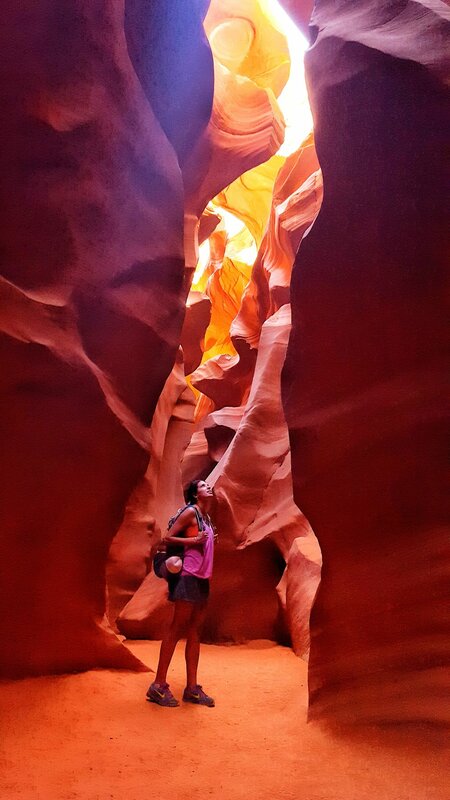 Three things actually: Antelope Canyon, Horseshoe Bend and Lake Powell! Behold three incredibly scenic places all within 12 miles of one another. 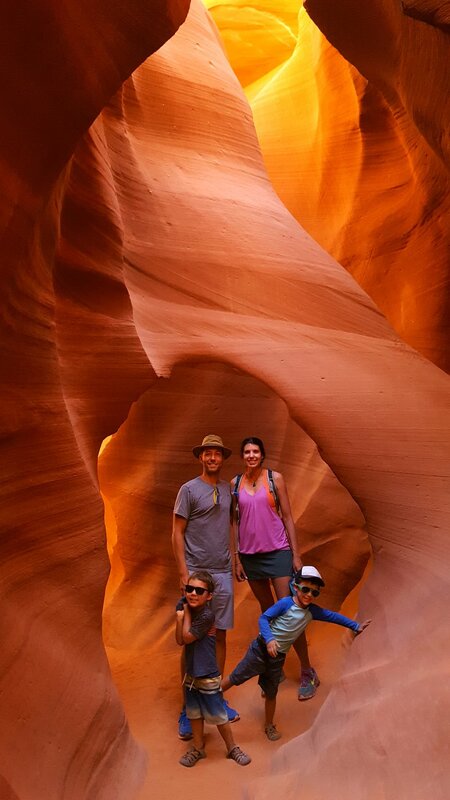 A couple of friends actually posted photos on Instagram of Lower Antelope Canyon that reminded me how badly I wanted to witness it in person (thank you, Lindsay and Allyson if you're reading). Assuming I'd have no luck getting tickets at the cusp of busy season, I still hopped on the site to give it a fair shot. 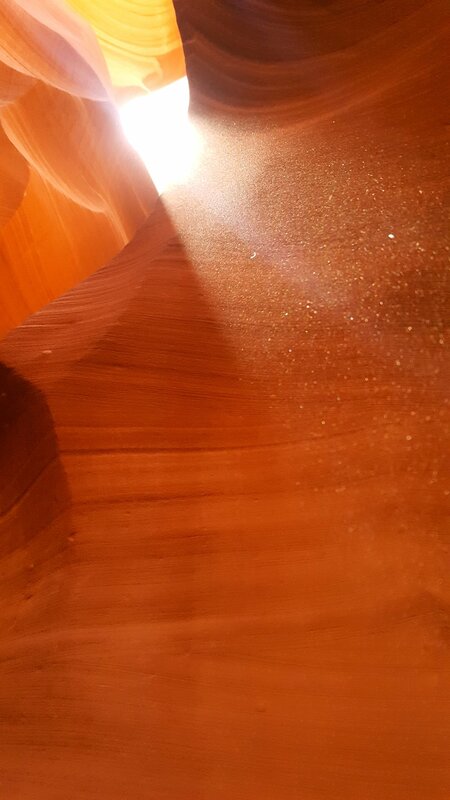 FYI, there are only two companies that embark on the Lower Antelope Canyon tours: Ken's or Dixie Ellis' and you'll likely need reservations if you want to ensure you see it. Which you do! After reviewing the availability, we took the only four morning spots left in the one week period that we would be in the area. The seahorse - can you see it?! The boys happily threw sand in the air to show the ray of light. I'll allow the pictures to tell the story with one exception. It was pretty congested at the beginning. We were closely tailing another group, and another group was closely tailing us. Eventually, halfway through, we spread out allowing the groups some breathing room but to say we felt a little bit like herded cattle was not an understatement. But the beauty of this place speaks for itself. After descending down a steep ladder we realized all our senses were in for a treat. We snaked our way through one of most beautiful natural trails our feet have touched. The way the rocks twisted and turned, inviting our eyes to study its deep orange colors and unique curvatures and lines. Not only did we enjoy it, but our four year olds did too. Scrambling rocks, scaling ladders, observing the formations, seeking the sun from the small crevices above, and finding our way through this beautiful maze was just as exciting for the boys as it was us. Whether you catch this place in the off season or on it is definitely worth doing, no matter what your age or size! 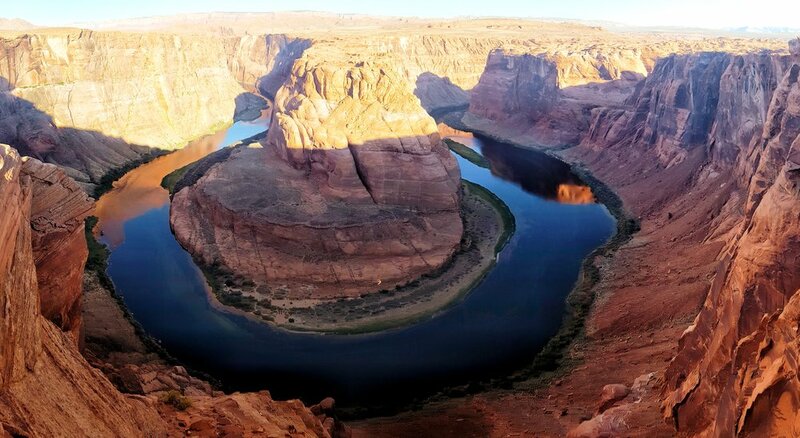 We actually attempted to visit Horseshoe Bend three times while in Page. The crowds were relentless to say the least. The third time was a charm though. We ended up camping for free one night right in the parking lot of Horseshoe Bend (who knew!) which rested on the perimeter of town along a steady stretch of highway. While the cars zooming past in the middle of the night wasn't ideal for us, thankfully the boys never stirred. Staying here allowed us to see "the bend" at sunset AND sunrise. Boom! For sunset, it hardly felt like we were getting a nature fix so to speak. The short hike looked like a busy trail of ants working its way down to the viewing area. Once at the edge, gaining a close look of "the horseshoe" was nearly impossible. It was teeming with tourists of all ages, sizes, and nationalities. I could hardly believe this many people were lined up along the fringe of the steep canyon walls. But once we managed to shoulder our way into our little slice of heaven, was it gorgeous? Why yes. Yes, it certainly was. 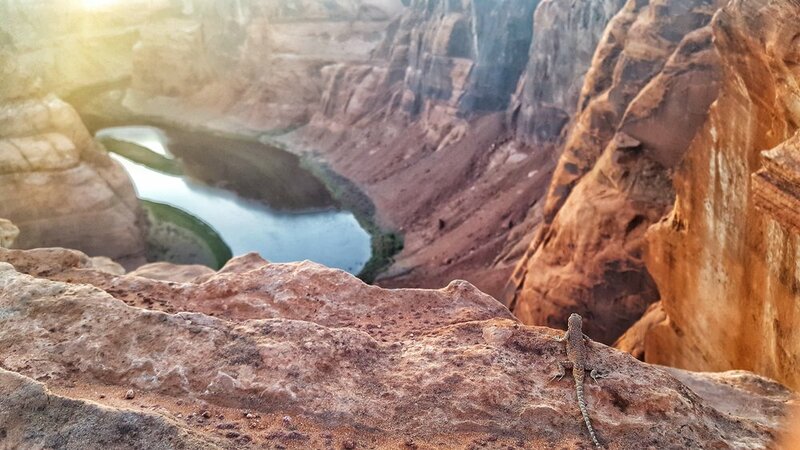 Even the lizards want in on a glimpse of this stunning place! Dadiko and Reid (holding Reid's hand for dear life...there were no guardrails anywhere!). It doesn't look creepy but trust me, it was! So steep. One section of "the horseshoe" during sunset. Even if you can see the whole 'U' it's still breathtaking! Free camping in the parking lot! But sunrise, you guys, was the time to come! I ended up sneaking out of the van around 6 am to catch the first rays of sunshine on the rust-colored canyon walls. I'll admit, we never got up before the kids our entire year on the road. I can't even remember seeing any sunrises. This one had me at "less crowded" though so I was determined not to miss it in all her glory. I pulled out of bed, tossed on my shoes, and rocked the old-lady powerwalk to the trail head. Then I realized something. I might be one of the only few here. Hallelujah! If you've been at sunset, then you know a couple people is unheard of at Horseshoe. A handful of people, the sun warming my backside, and actual silence accompanied me on the trail. This was the way to experience Horseshoe Bend, in my opinion! Also, please note, I had no children by my side stopping every 1.8 seconds to pick up unsuspected "treasure" on the ground, or ask if they can have a drink of water (which we had none of the day before, by the way. Mom fail). I'll confess, the lighting might be a touch more harsh at sunrise, but to sit and actually enjoy the serenity, peace, and beauty of Horseshoe Bend in the morning beats elbowing my way in to see it in the afternoons. In addition, it's blazing hot by mid-morning. By the time I reached the parking area where Spud and my family awaited, the cars and buses were beginning to pour in. This was definitely worth waking up early for. I mean look at that HORSESHOE!! And because of that I just had to commemorate the morning by eating pancakes at McDonald's with the family. Here I finally was able to see the Horseshoe in its entirety!!!! Page, Arizona hugs the border of Utah, and to round off our time in this stunning section of the US was a visit to Lake Powell, a place I had always wanted to go. Just over the impressive Glen Canyon Dam Bridge and a few miles into the Glen Canyon National Rec Area sits an an ideal strip of beach perfect for 'primitive camping', as they call it. Or as we called it, beach camping!!!! I love beach camping (reminds us of Baja). Chip will chime in here and likely say he loves beach camping...on beaches that don't contain salt water. With that, I think this might've been his favorite one of the whole year! Flying high over Lake Powell. Any slight mention that this was the last place we would be camping on our year would send me into what looked like an adult toddler tantrum. I hated to be saying goodbye to this life that was now all too familiar to us. But we wanted to go out with a bang, so we coordinated a meet-up with our friends, The Butzens, with whom we actually camped with on our very first night hitting pause, 365 days prior. We had already been enjoying Lake Powell a few days when we excitedly got to show it off to the Butzen fam on our very last night. Check this place out, it was heaven. I will also remind you that it was 97 degrees all of the days. Which in turn meant we spent 97% of our time in the water. From left to right, front to back... Spud, Bennett, Reid, Sam, Owen, Sprocket, Lindsay, Chip, Katie & Brian! The Butzens sent us into our pause and they're takin' us out! So much sun, so many beach toys to play with. Celebrating our last night and Chip's birthday! In the water until nightfall. Just doing the day to day - music, dancing, being silly, and living it up somewhere cool! It has taken me so long to write this post that over this period of time I've noticed my thoughts have shifted from being heartbroken and morose to an overwhelming feeling of gratefulness and contentedness. I think it was all part of the process for me. The ideas, changes, and things we have learned over the year is being incorporated into our our life at home and for that I am relieved. We found ways to ensure family time, meeting new people, and traveling as still being a big part of our lives, and work (although important!) is not the main focus but a secondary extension of who we are. If it weren't for this trip I'm not sure where our hearts would be - I'm guessing still conflicted and yearning for travel or what could have been. But in the end, we are so thankful we pushed to put our dreams to the test, for following through with them, and for having one of the most successful years of our lives. We felt more alive than ever. The sights, the people, the memories, the growth, and the ability to live life minimally was freeing. We honestly still can't believe it came to fruition. It truly does feel like it was a dream. An insanely, wildly, incredibly fun dream.